After a day of brief tests and false starts caused anticipation to build further across fan discussion forums, the website officially went live earlier this evening, at around 20h00 CET. Available for nine different countries (with a further two to follow), the website is without doubt one of the resort’s most ambitious online projects to date, and in today’s world forms a key part of the 15th Anniversary advertising campaign, scheduled to be one of (if not the) biggest in the history of Disneyland Resort Paris. Upon selecting your country or language, you’re treated to a “3D” flash teaser showcasing all of the key events, the same teaser previewed via an email newsletter late last week. After the teaser, the Flash website opens to the music of Disney’s “Where Dreams Come True” campaign (itself music from Universal’s Peter Pan movie, believe it or not), with a scrolling view giving visitors the feeling of actually being inside the park itself during the Anniversary. This is where a concept from a previous campaign website begins to appear – the introductions and videos of real people and real characters interacting with the Flash environment. Originally used for the Space Mountain: Mission 2 website in 2005, they have been brought back here to allow a red-suited host and his Red Carpet friend to introduce each of the main pages. Visitors have the option of scrolling through several animated screens (seen below), or, for quicker navigation, the drop-down menu at the top links directly to the pages and games currently available. Each of the colourful pages link into the categories of events seen the teaser videos, with the first – “More Dreams” – presenting Disney’s Once Upon a Dream Parade. No information is currently given about the parade, but an animation of the first parade float making its way around a stylised Main Street USA does give us an idea what to expect come late March. Make sure you have a listen to the music featured on this page, too, since this is almost certainly an instrumental excerpt from the anniversary’s new “Just Like We Dreamed It” song. The next page is for Crush’s Coaster, and so uses an undersea theme and bubbles to link to the extra pages – both of which currently unavailable. “Even More Wow” can be found with Cars Race Rally, where Lightning McQueen and Mater sit outside Walt Disney Studios Park, important since nowhere else is it mentioned that all of the new attractions are infact in the resort’s second park rather than its first. Up next with an Alice’s Curious Labyrinth theme and an appearance from The Enchanted Fairytale Ceremony stage is “More Scoops”, which links to a clever new idea to help build excitement about the 15th Anniversary – a blog. We’ll have more on this in a separate article soon! The features on this Discoveryland-themed page have yet to be added, but we’re promised the chance to share photos of Disneyland holidays with families and friends, or send our own dreams and wishes in, to create a complete wishlist for all guests. With an Adventureland Bazaar theme, this page presents games and activities such as the “Dream Invitation” competition (see below). These pages allow users to create their own invitations using graphics available on the website or by uploading their own images. These can then be sent to friends or entered into the competition to pick the best invite. Showing Fantasyland’s Sword in the Stone (perhaps a hint the streetmosphere show will return for the celebration?) the final themed page presents the three key special offers for the year – Kids Under 7 Free, Free Days & Nights and a “Deal of the Day”. Downloads are always a popular website feature, and it’s good to see Disneyland Resort Paris hasn’t forgotten to let visitors take a bit of the magic for themselves. The full official key visuals for the various attractions are available to download in full (without a single (C) Disney stamp or legal text), along with a well-designed screensaver and several e-cards. The most interesting wallpaper right now is shown above – a previously unseen key visual for Disneyland Park’s Extra Magic Hours, with a giant hourglass over the park! Finally the two areas which will undoubtedly receive the most clicks. First, the full schedule of all the Anniversary events. Secondly, and best of all, a selection of official videos previewing the year. In addition to the teaser which opens the website, you can see a good quality English version of the early trailer we saw in French back in October and most exciting a new Behind-the-Scenes video featuring several important backstage Cast Members talking about their excitement for the event – with clips of Crush’s Coaster and Cars Race Rally slotted in! Strangely, since the resort previously wanted to keep this silenced to ensure guests didn’t postpone visits, the Tower of Terror is featured in both of the latter videos. We’ll have a full report on this up next. 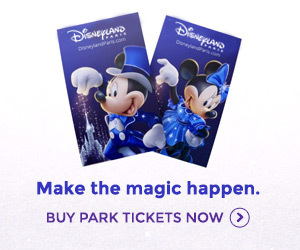 And there we have it – Disneyland15.com is now live for the world to see. Will it help sell the celebration to the masses? We’ll have to wait and see. With so many pages still yet to be revealed this probably won’t be the last time it appears here, and with the celebration spanning a full year and set to include features such as Tower of Terror and Stitch Encounter (which won’t be announced until this Summer), hopefully the site will be cared for and built upon for the entire 12 months ahead of us. Look out for separate articles on DLRP Today covering the new Official Blog and interesting Behind-the-Scenes Video shortly.